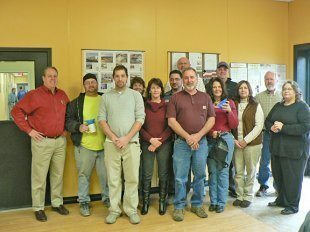 On January 16th, twenty employees at Panel Built embarked on a three month weight loss competition. The competition stemmed from hearing numerous complaints of holiday weight gain around the office. It was then that Panel Built, in partnership with local gym Blue Ridge Mountain Fitness, decided to have our own “Biggest Winner” contest. An obvious play on television’s “Biggest Loser” show, the name “Biggest Winner” was chosen; because Panel Built believes anyone who wants to improve their health is a winner! When two employees from the Fitness Center came to Panel Built and took everyone’s weight, height, and body fat percentage the mood in the room was excitement. Jennifer Puryear, a personal trainer at Blue Ridge Mountain Fitness, did the math and calculated everyone’s BMI (Body Mass Index) from the measurements they took. “This was the first corporate weight loss challenge we have been a part of,” said Sue Ellen Morlock, Director of Member Services at the Fitness Center. There will be a first and second place for both male and female categories. Among the prizes offered were 1 day paid vacation time and one hundred dollars! On Monday, April 16th, the final weigh in took place. While everyone did a great job, there were a few participants who stood out. The top two men and women in the competition combined for an average loss of 9% of their body weight. As a company, Panel Built lost a total of 136.5 pounds and lost 4.4% body weight. Congratulations to all who participated!